Liberty Auto Center has completed more brake repair jobs than we can count. From drum brakes to disc brakes, shows to pads, our highly trained technicians know the brake system of your vehicle and can perform an extensive inspection and replacement. That means any make or model car that enters our service center will be dealt with quickly and professionally. You can drive off the lot with complete confidence in the service Liberty Auto Center provides. When it comes to brake repair, it is a good idea to have your brakes inspected every 12,000 miles or once per year. A technician will conduct an inspection of the brake system’s linings and key components before offering a detailed diagnosis of any issues. Based on manufacturer recommendations, our expert technicians will determine how to proceed. 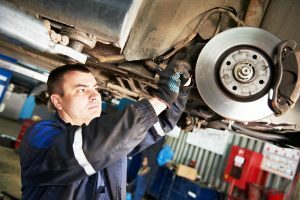 Many vehicle service shops may lure you in with the promise of cheap brake pad replacement or brake repair and then switch it later. However, we believe in open and honest pricing. The cost for repairs or replacements may vary depending on your vehicle’s make or model. Our singular goal of providing quality repair services always comes first, no matter the cost or the scope of the job. When you give us a call, we can offer an extensive estimate of the usual costs for brake repair service with Liberty Auto Center. Of course, a more comprehensive quote will require the vehicle to come into our shop. Our technicians will examine the braking system and write up their diagnosis, and we can move forward from there. If it has been some time since your vehicle had a proper brake inspection or you know your brakes need repairs or replacements, call Liberty Auto Center today at 240-686-6613 (Flower Hill) or 240-912-5625 (Redland). We’ll have your vehicle back to you in no time at all!